Created for the 2011 Pittsburgh Biennial at the Andy Warhol Museum, Amisha Gadani‘s piece is a cuttlefish inspired animal defensive dress. Cuttlefish are ocean-dwelling invertebrates in the same family as octopuses, and squid. 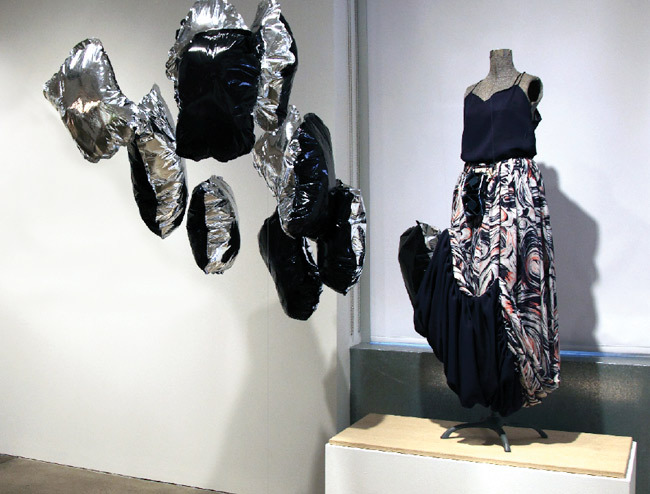 Amisha’s dress mimics the ink-squirting defense of these animals by releasing an assortment of handmade black and silver helium balloons when the wearer is intimidated. Two fans resting near her waist blow the balloons toward the attacker as the wearer quickly backs away into safer area. This dress is the fourth Amisha’s series of animal inspired defensive dresses which include an inflating Blowfish Dress, a quill erecting Porcupine Dress, and a fabric limb losing Skink Dress. Amisha lives in Los Angeles and works remotely for the STUDIO and as artist in resident at the evolutionary biology lab of Dr. Michael Alfaro at UCLA.